Independent Kennedy MP Bob Katter has announced he will back the Coalition. 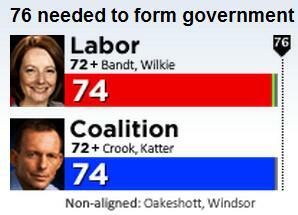 This now gives Opposition Leader Tony Abbott an equal footing with Labor on 74 seats. This leaves remaining Independent MPs Rob Oakeshott and Tony Windsor to decide who they will support. Katter cited Wild Rivers, mining tax, ETS, indigenous issues, and the sacking of Kevin Rudd, that he was "extremely angry" about, as reasons for him to back the Coalition. "I can get no agreement from Julia for indigenous workers to building housing at Yarrabah," Bob Katter told a press conference a few minutes ago. This announcement is a bit peculiar, as Katter was the main advocate of the 3 Indies sticking together, now he has pre-empted a collective decision. Presumably this is because he has decided on Abbott and wants to put pressure on the other 2 to go along with him. Makes him look a bit flaky, unreliable. Congratulations, Prime Minister Gillard - now the fun starts. The Mad Katter merits a stand-up turn at the Melbourne Comedy Festival. He had 'em doubled up in the aisles during Q&A last night. I was intrigued by the lesbian lady, who was incensed that all Bob seemed to care about was his own electorate and the people living in it and what was he going to do for her ? I would like to ask what her MP in inner Sydney or Melbourne is going to do for us up here ? Nothing, I presume. Personally I am not interested in people's "lifestyle" choices. I really don't care. If gay and lesbian people want to get married then that's fine by me, but I hardly think it is a matter of national importance. And I am getting a bit tired of hearing how hard-done-by they are all the time. Bob might be mad, but he made some very valid points and some of the comments and reactions from this so-called "sophisticated" audience were both arrogant and condescending. I don't think they have a clue what life is like outside their little world in Melbourne and Sydney and that is exactly the problem we have up here with the political representation we get. Mad Katter said the number of gays in No Queensland was .00001%. Bob Katter, can I introduce you to Warren Entsch, Mayor Val Schier, and Coucillor Sno Bonneau? Thankfully, Cifton Ratbags Don't Rule - they just rave on impotently. What a jerk-off! None of the 3 people he names are gay - not that it would matter if they were. And Nick got it right - a constant feature of the post-election debate has been the condescending attitude towards the 3 Indies, especially Katter, who was routinely portrayed as a hayseed. Just goes to show how city-centric the commentariat is.